Photographed at Naiberi River Camp, s.e. of Eldoret, Kenya. 15 October 2010. Bee-eaters capture flying insects and as their name implies many are indeed bees. By handling and killing the bees in their long sturdy bills they are able to do so without getting stung. Other flying insects are also taken, but especially those attracted to flowering plants. Given that plants require bees for pollination it seems that these birds are in an adversarial relationship, ecologically speaking. 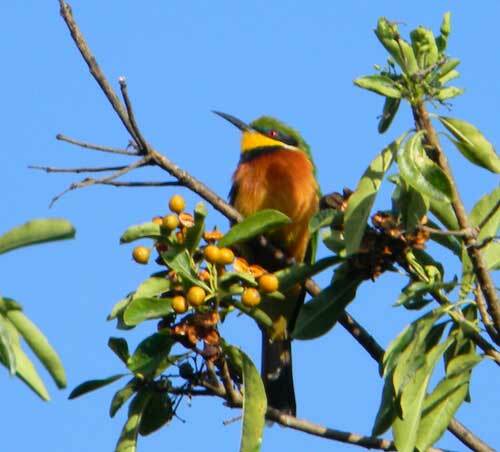 Cinnamon-chested Bee-eater is found in highland areas of western Kenya in sunny open areas with trees and shrubs or else close to the forest canopy. Copyright Michael J. Plagens, page created 7 Nov. 2010.